We need to take creativity seriously in education because it looks, increasingly, as though children's lives and livelihoods may depend on it. So how can we make creativity happen in education - ensuring educators are creative educators, and teachers are creativity nurturers? 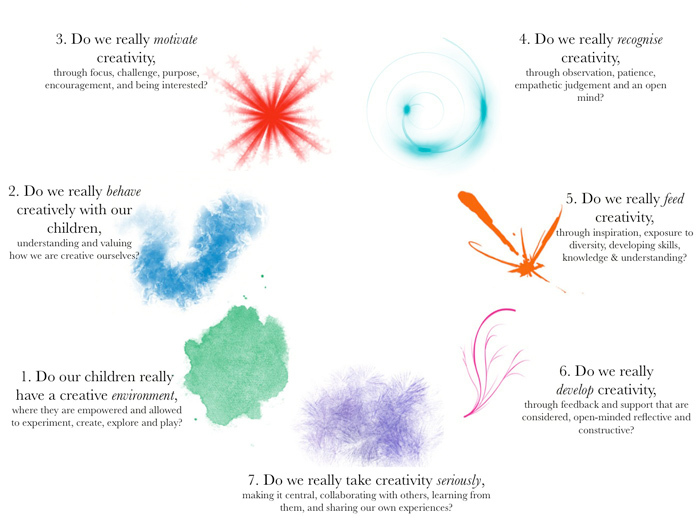 This visual poses seven self-reflection questions for creativity nurturers. Putting them together, I've drawn on several key sources of evidence and experience around how you most effectively nurture children and young people's creativity. Below the image are a short set of slides putting the questions into some context and links to download this visual as a poster,.